Your car needs an alignment to keep your tires wearing correctly. Also, to keep your steering wheel straight - if the steering wheel becomes crooked it is hard to hold the wheel and you may notice a pull to one side. 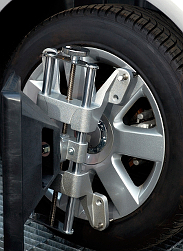 An alignment consists of making sure that the wheels are at the correct angle. Numerous conditions can cause tires to become out of alignment. These include potholes and curbs and suspension wear. It is recommended to align your tires once a year or every 15,000 miles. If your tires are wearing evenly you can go for a long time without the alignment, however, the above is the recommended industry standard. Regular alignments can save you money by ensuring you get the most value from your tires.